SOUL OF SYDNEY FEEL-GOOD FUNK SOUL DISCO vibes & beyond. | MIXES | EVENTS | LIVE MUSIC & more. Documentary: The Night JAMES BROWN Saved Boston (April 5 1968) | The Power of Music! April 5, 1968. It is the day after one of the most catastrophic moments in the history of the civil rights movement. The film documents that remarkable concert and the politics around it. Boston Mayor Kevin White and his colleagues almost by accident realized that by televising the James Brown concert they could keep people indoors that night prevent widespread rioting. The film is almost testimony to the power of music in general and the power of James Brown’s music in particular. The film is a tribute to the Godfather of Soul and the role he would come to play in working for civil rights. Backstage at the Boston Garden, the mood is somber, appropriately funereal. Just 24 hours ago, Martin Luther King, Jr., the most important and beloved African American leader in America, has been assassinated, and though James Brown is booked that night for a show, nobody really wants to go onstage and play. On the morning after the assassination of Dr. Martin Luther King, Jr., city officials in Boston, Massachusetts, were scrambling to prepare for an expected second straight night of violent unrest. Similar preparations were being made in cities across America, including in the nation’s capital, where armed units of the regular Army patrolled outside the White House and U.S. Capitol following President Johnson’s state-of-emergency declaration. But Boston would be nearly alone among America’s major cities in remaining quiet and calm that turbulent Friday night, thanks in large part to one of the least quiet and calm musical performers of all time. On the night of April 5, 1968, James Brown kept the peace in Boston by the sheer force of his music and his personal charisma. Brown’s appearance that night at the Boston Garden had been scheduled for months, but it nearly didn’t happen. Following a long night of riots and fires in the predominantly black Roxbury and South End sections of the city, Boston’s young mayor, Kevin White, gave serious consideration to canceling an event that some feared would bring the same kind of violence into the city’s center. The racial component of those fears was very much on the surface of a city in which school integration and mandatory busing had played a major role in the recent mayoral election. Mayor White faced a politically impossible choice: anger black Bostonians by canceling Brown’s concert over transparently racial fears, or antagonize the law-and-order crowd by simply ignoring those fears. The idea that resolved the mayor’s dilemma came from a young, African American city councilman name Tom Atkins, who proposed going on with the concert, but finding a way to mount a free, live broadcast of the show in the hopes of keeping most Bostonians at home in front of their TV sets rather than on the streets. Atkins and White convinced public television station WGBH to carry the concert on short notice, but convincing James Brown took some doing. Due to a non-compete agreement relating to an upcoming televised concert, Brown stood to lose roughly $60,000 if his Boston show were televised. Ever the savvy businessman, James Brown made his financial needs known to Mayor White, who made the very wise decision to meet them. Brown successfully restored order while keeping the police away from the crowd, and continued the successful peacekeeping concert in honor of the slain Dr. King on this day in 1968. An afternoon homage to one of the central figures who shaped FUNK & SOUL music as we know it and inspired GENERATIONS of MUSICIANS, DJ’S & PRODUCERS. Music by Sydney Funk Powerhouse GANG OF BROTHERS & Friends (live) plus DJ support by SOUL OF SYDNEY DJ’s & Friends. TOUR NEWS: SUM 7 Piece New York SOUL, JAZZ, FUNK coming to Sydney this April 19. Described by Red Eye Record “as a band for fans of Hiatus Kaiyote and Jill Scott”, S U M, the hybrid Jazz/Funk/Pop/Soul band from New York City will be in Australia for the first time for their Welcome Tour! New York City hybrid pop/jazz/soul/funk 7 piece band S U M (pronounced soom) debut their dynamic and spirited “The Welcome Tour” show April 18th at The Newsagency, Sydney and April 19th and 20th at the Paris Cat Jazz Club in Melbourne. One of the most exciting emerging acts to visit our shores, S U M’s strong message of self acceptance and authentic self expression anchors the bands philosophy, splintering into the magic of their genre bending sound. S U M was created by multi-talented lead arranger, composer and drummer Steve Belvilus (Les Nubians, Hamilton: An American Musical, Natalie Cole, Hezekiah Walker, Scott Jacoby [SIA/John Legend]) and lead vocalist and co-writer Patryce Williams whose multi-faceted creative expression includes theatre and film in addition to her musical endeavours. Both executive producers of their debut self-titled album released in September of 2018, S U M gained widespread recognition for their melodic, forward thinking, intricate and playful compositions including a feature on the tastemaker music siteBandcamp as Best Soul Music Album Release in September (2018), as well as a recent review by Music Connection magazine (included in this year’s Grammy’s gift bag for all attendees, record executives, labels and artists) highlighting the band’s overall performance “showcases their versatility and prolific musical skills…”, amongst an impressive list of articles and interviews world wide. Their single video clip ‘It’s Alright To Be Me’ has been featured in digital publications across France, USA and Australia due to its charming creative visual concept mimicking the bands positive message set in a school environment from a teacher and student grand narrative. Their live shows can be described as highly interactive, uplifting, expressive and charismatic. S U M has performed at the Baiser Salé in France as part of the Jazz Sur Seine Music Festival, at The Kennedy Center in Washington D.C, Musikfest in Pennsylvania, NPR Radio, Brooklyn Bowl in New York, The B.B. King Blues Club in New York, Rockwood Music Hall and Club Bonafide in New York to name a few. 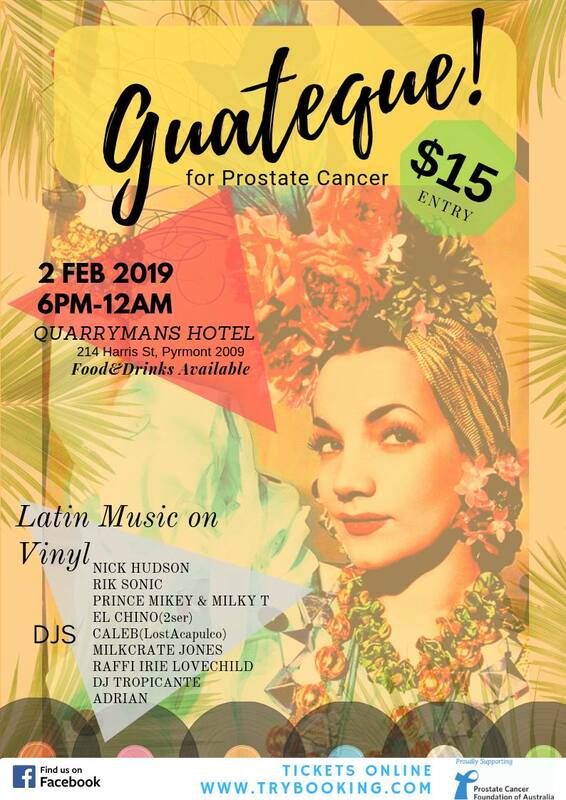 Our good friends are hosting this dope fundraiser for prostate cancer featuring all vinyl selectors dropping latin inspired joints to help raise money for prostate cancer foundation of Australia. International DJ playing at Mod, Soul and 60’s R’n’B nights and weekenders across the UK, Holland, Germany, Spain, Italy, Japan and Australia. DJ at Mousetrap all-nighter in London for 10 years. A selector and producer with supports for Stro Elliot (The Roots), MNDSGN (Stones Throw), played this years Melbourne international Jazz festival and was just featured on Giles Peterson’s Worldwide FM. A lover of Reggae, Dub, Ska, Rocksteady and Roots. Co-founder/builder/operator of Sydney’s Inner West Reggae Disco Machine sound system. Also plays mixed bag musical selections in various bars around Sydney. Visual artist, dreamer and maker of things. Resident on the decks for Queen Bee @ Hive Bar: a regular night of ladies playing vinyl only. Passionate record collector and resident DJ in the Northern Soul club, The Sweetest Feeling. Also with appearances in Soul weekenders around Australia with a great selection of Soul & Funk. You can also find him playing records on a Wednesday night @ The Hive bar in Erskineville. DJ/Radio Presenter/Music Producer and the pilot of the long-flying radio show, Departure Lounge, which goes on air every Saturday afternoon on Sydney Community Radio Station 2SER.107.3. El Chino’s eclectic selection covers musical genres from, old/nu-Jazz, Broken Beat, Brazilian, Latin, Soul, Funk to Folk and Electronica. Some highlights are Rebublica in Sao Paulo with DJ Nuts in 2014 and in the first Afrobrasiliana Warehouse Party Portugal Club in 2017. Admired Musician from Mexico currently playing in Los Tremoleros in Melbourne, making his first appearance in Sydney on the decks! Bass player from Lost Acapulco surf band who’s last performance in November filled up the Zocalo Capitalino in México DF, he is bringing us a great variety of cumbias. He has played along side Daddy-O Grande and many more surf music legends. Guitarist and co-founder of CUMBIAMUFFIN, with a great ear for Latin Music. Colombian born Carlos Arango (aka Tropicante Sound Sistema), is a member of Sydney’s underground DJ collective Pineapple Republic, and a well-renowned selector, event promoter and host of some of the most iconic Tropical nights around the best venues in Sydney, exposing people to the new wave of Latin, Caribbean and global beats that are still fresh to Sydney’s night life. Part of Tropicante’s credits include hosting events with internationals like Quantic and Daniel Haaksman. Sonido Fino @ Café Lounge, Kings X Hotel, Bare Necessities @Cliff Dive + More. Invitro, Candelario, Escobarosas, La Residencia. His main thing is Reggae, collecting records since the early 90’s. Was part of the Firehouse crew in the late 90’s but also loves latin music – especially 60’s & 70’s Salsa Dura from NY and Colombia. Music connoisseur, collector of great vinyl, who has played for Jennifer Lopez. You might have seen him also @ The Hive Bar, and playing in Gonzo’s night on Saturday nights at the Bank Hotel in Newtown.